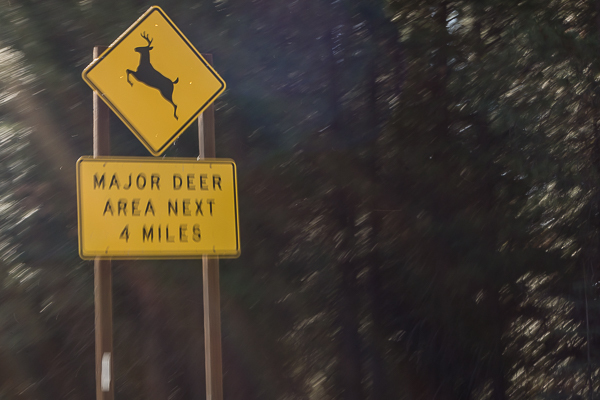 Being from NC we are more than familiar with the problem of deer on the roadways, but I have to admit that we had never seen a sign like this before. We immediately become ultra alert as we can’t imagine what a major deer problem entails. Stormy ponders whether a doe in this area would be called a Majorette? Today we head farther north and our first stop is Lassen Volcanic National Park or at least as close as we can get to it since recent snows have many roads here closed. We enjoy the scenery on this drive, but are even more entertained by the strange roadside signs and airplanes. 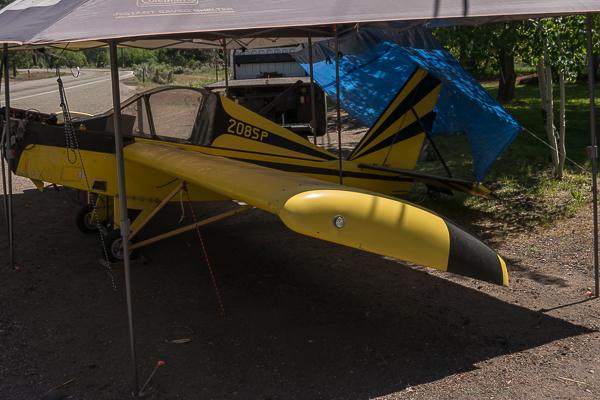 Yes, it appears that people locally store their planes beside the road instead of at airports. We soak up the short educational trail at the road closure point in Lassen, but since all other park services are closed due to snow (14′ on the road up) our visit at this park is short. Our next stop is one that Terrie has been excited about since she left home. She can hardly contain herself as we arrive at the Subway Cave Lava Tubes. We did not print out the self-guided tour from the link so had to rely on the info available at the site most of which had been removed by vandals. I tell you this to explain why we were so lost once we got in the dark, dark tunnel. Terrie jumps out of the truck as only someone so filled with joy can do and ran up to read the entrance sign to the cave. She reports back to us that according to the sign we all need to bring a couple of light jackets for the tour. Not questioning her authority, we all suit up by donning all the extra jackets and shirts that we have. 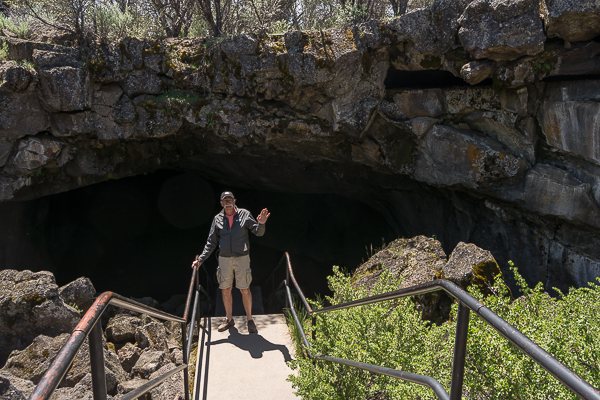 Just before we enter the lava tube cave, we stop to read the sign again. I have to admit, I thought it said light jackets too at first (old age vision…) but what we finally realize is that it says we need a couple of lights. Oh yeah, it’s a cave and it is DARK! After scrounging up an assortment of tiny flashlights including cell phones, off we go. Wow – it is pitch black in there and our little flashlights are barely cutting it so we try to navigate by bouncing our voices off the walls like bats and Terrie LOVED it! She was thrilled that we were not sure which way to go to get out and she especially enjoyed the crevasses in the floor whose depth is immeasurable! It requires all three of us to remove Terrie from the cave and proceed with our trip, but as much as we all love seeing Terrie enjoy herself we have much left to see today. I give to give all the credit to Dean for researching this trip and finding cool places to visit. He told me that he used Google Earth to go along the route and look for interesting places that others had found and posted picture of on Google Earth. All the mistakes I ever made in my life were when I wanted to say no and said yes.